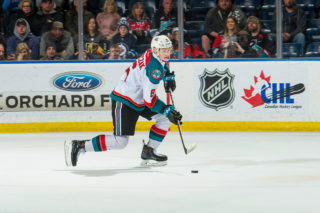 Game Day Preview: The Kelowna Rockets face the Seattle Thunderbirds for the second time in the last five days. These two teams squared off Saturday in Kent with the T-Birds earning a 4-1 win. 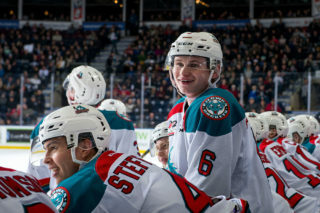 Kyle Topping scored the lone goal in the Rockets third straight loss. Seattle scored three of its four goals on the power play. Liam Hughes was solid in goal with 44 saves. The Rockets enter the game with a record of 1 and 7, which is the slowest start in franchise history. The 2006-2007 team had a win and a shootout loss in its opening 8 games. The Rockets are in Kennewick, Washington to face the Americans Friday before hosting them Saturday night at Prospera Place. Next weekend the Rockets are in Victoria for a pair of games on Friday and Saturday before playing their third game in three nights Sunday October 21st in Vancouver. Trade Winds Blow: The Rockets made a trade with the Victoria Royals Saturday September 29th. The team acquired 20 year-old Lane Zablocki for a conditional 7th round and conditional 4th round bantam draft pick. 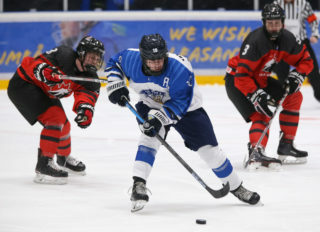 Zablocki is a third round NHL draft pick of the Detroit Red Wings (2017 – unsigned). In the 2016-2017 campaign, Zablocki scored 28 goals split between the Regina Pats and Red Deer Rebels. Zablocki has played with the Pats, Rebels, Hurricanes and the Royals. Zablocki never played a game with the WHL team that drafted him in 2013 – the Prince George Cougars. Broadcasters Notebook: Ryan Bowen plays in his 150th career WHL game tonight against Seattle….We’ve got the Cup! The Rockets were awarded the 2020 Memorial Cup on Wednesday. The ten day tournament will take place May 22nd to 31st. It marks the second time in franchise history the team has hosted (2004) and will mark its 6th appearance at the prestigious event. 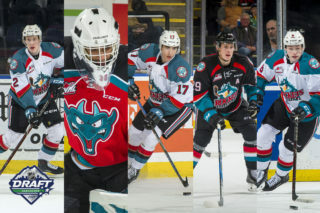 The team has made previous appearances in 2003, 2004, 2005, 2009 and 2015….Five members of the Kelowna Rockets have been named to NHL Central Scouting’s “Players to watch’ list. Forward Nolan Foote is an ‘A’ prospect, meaning a first round candidate. Kaedan Korczak is a ‘B’ prospect which means he is projected to be selected in the second or third round. Roman Basran, Kyle Topping and Lassi Thomson are ‘C’ prospect, which means they could be taken in the third to the seventh round…. The Rockets have failed to open the scoring in 7 of the 8 games this season….The Rockets have trailed going onto the third period in 7 of the 8 games….Head Coach Jason Smith returns for his third season at the helm. 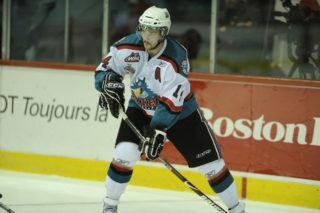 Both assistant Kris Mallette and Travis Crickard enter their 5th seasons in the WHL….The Rockets are in their 24th season in the Okanagan after relocating from Tacoma for the start of the 1995-1996 season…The Rockets have made the playoffs 11 consecutive seasons…The team has averaged 104 points in the last 6 seasons including a franchise high 118 in the 2013-2014 campaign when the hockey club lost only 11 times. Most power play goals allowed: 3 @ Seattle October 6, 2018 (4-1 L), 3 vs. Vancouver October 3, 2018 (5-0 L).